DVD Shrink (or DVDShrink) is the name of a once-famous free DVD transcoder program for DVD ripping and DVD backup, with the final and terminal release 3.2.0.15 built on actually July 25, 2004. Providing a free solution for shrinking original DVDs onto recordable media, DVD Shrink operates in two main modes, "Reauthor" and "Full Disk" with minimal loss of quality. I have two kids. Normally when buying them a DVD, I make them a copy with DVD Shrink because sometimes they don't take care of them. But I've recently bought a new computer with windows 8 OS so I tried installing my copy of Nero 7 but it kept saying could not install due to something I can't remember exactly but is there any way I could use DVD shrink without Nero if so how? Can DVD Shrink run well on Microsoft Windows 8 Windows 10? In theory, those programs compatible with Windows 7 can also run on Windows 8. However, since the author of descargar / baixar DVD Shrink has been stopped developing it from 2005, it is not supporting the new Windows OS (Windows 10 ) well enough. It works better on Windows 9x/2000/XP. Can DVD Shrink work with Nero 7, 8 or 9? As is known to most uses of DVD Shrink, this freeware requires the installation of Nero. But you may have found in most related forums that DVD Shrink does not work with Nero 7, DVD Shrink does not work with 8 or DVD Shrink does not work with Nero 9. Actually, DVD Shrink requires an older version of Nero (at least version 7 or lower). The Vista family of Microsoft Windows (Windows Vista, Windows 7) may have issues running DVD Shrink. The free DVD Shrink does not work well with Windows 8/10 or Nero 7/8/9, and cannot burn and rip DVD while decrypting new DVD copy protections independently. So it is time to find a DVD Shrink alternative without the need of installing Nero or the like. WinX DVD Author is a totally free and standalone software to replace the obsolete DVD Shrink for video to DVD burning, creating and authoring. It allows burn video files from camcorder, webcam, Youtube, etc to DVD and supports the input formats like MKV, M2TS, M4V, AVI, ASF, MP4, MPEG, MOD, MOV, WMV, FLV (YouTube), RM, RMVB, Xivd, DviX, H264, 3GP, OGG, QT, VOB, etc. Besides, it can personalize the DVD with chapter menu & subtitle (*.srt). WinX DVD Copy Pro ranks No.1 as the alternative of DVD Shrink running on Windows 8 without the installing of Nero. It has a seamless support for Windows 10, 7 and 8 (32 & 64 bit), as well as Windows 98, NT, 2000, 2003, XP, Vista. It can also bypass and remove the new DVD encryption and copy protection technologies used in latest DVDs, including any kinds of RCE, CSS, UOP, APS, region codes, ARccOS and Disney DRM trick. 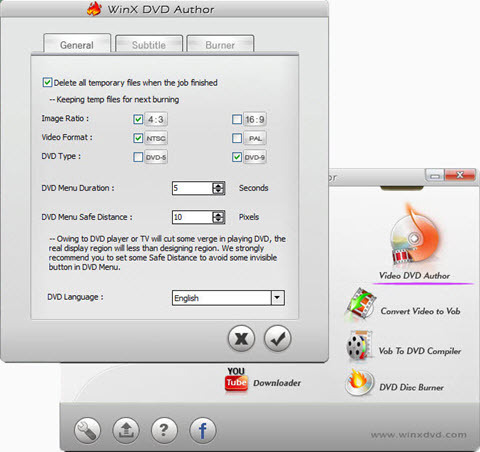 Different from WinX DVD Author, WinX DVD Copy Pro mainly serves as a DVD burner, cloner and mounter, capable of copying DVD disc to DVD disc, DVD to ISO image, DVD to DVD folder, DVD to MPEG 2 file, burning ISO to DVD, DVD folder/video to DVD and so on without the assistance of any other software. Especially, it can burn DVD on Windows 10, Windows 8 and Windows 7 perfectly! 1. Download the DVD Shrink Alternative on Windows. 2. Install and launch it in a regular manner. 3. Import source DVD disc, file or folder. 4. Select the destination for the output DVD folder and ISO image file. 5. Insert a blank DVD R / RW disc. Set the Temp folder if you do not have two DVD drivers working at the same time. 6. Click "Run" button to backup the DVD to the computer hard drive. 7. Click "Burn" button to start burning one DVD to another disc. WinX DVD Copy Pro - [100% Clean and Safe!] Best DVD copying software fully compatible with Windows 10/8/7/Vista/XP OS, enables you to 1:1 copy DVD to DVD disc/ISO image/DVD folder without any quality loss in a fastest speed while reserving intact original video/audio/subtitles. Best fastest DVD ripper and converter to convert DVD disc to digital video as MP4, AVI, WMV, MPEG, H.264, HEVC, MOV, iPhone XS/XS Max/8/7/6S/6, iPad Air 2/3/Pro, Android, etc. at fastest speed. Also enable you to 1:1 copy DVD to ISO image/folder/MPEG-2 file with original quality by accessing all DVD protections. The top best 3 DVD rippers for disc to digital conversion on Windows 10, 8, 7(32 & 64 bit), Mac, Linux, etc. 2018 top 3 DVD ripper to rip DVD movie to MP4, HEVC/H.265, AVI, MOV, iPhone XS/8, Android, etc. on Windows or macOS Mojave. VD disc to digital copy guide: learn how to convert DVD disc to digital file as MP4, AVI, MPEG, H.264, HEVC, MOV, ISO, etc. on Windows 10/8/7 and Mac, convert Disney DVD disc to digital videos with best DVD/disc to digital converter.